Taylor Gourmet is a sandwich shop that currently has two locations, both in DC. By mid-July they should have a new location open at 7820 Woodmont Avenue in Bethesda, MD. 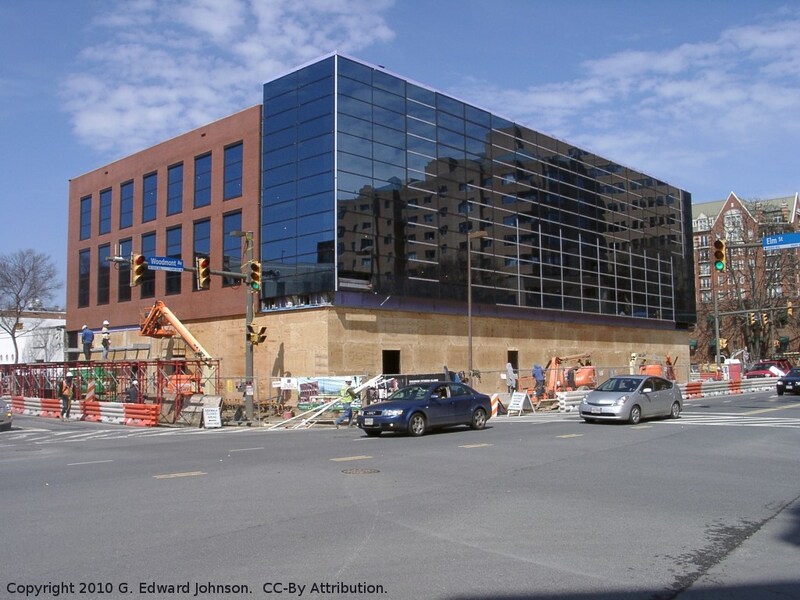 This is right on the corner of Woodmont Ave and Elm St in the new Equinox Fitness building. I have never been to Taylor Gourmet but judging by the comments I have read it seems like a good place and I am looking forward to trying it. 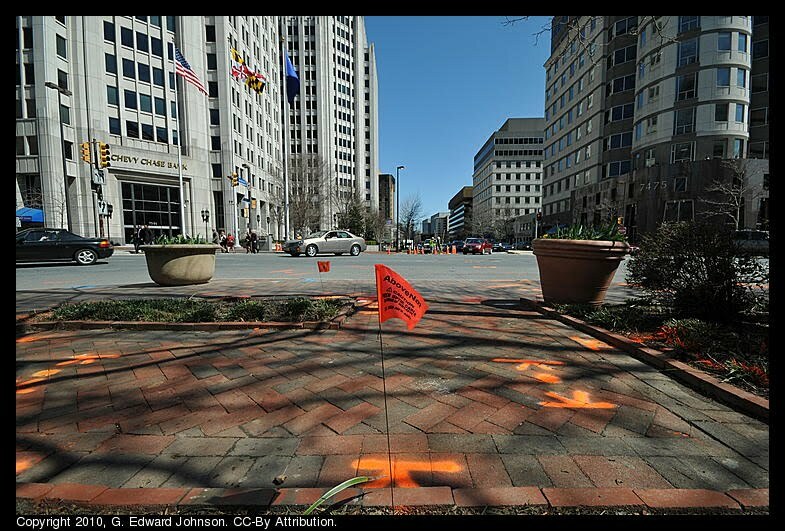 You can see the full coverage about this construction project. 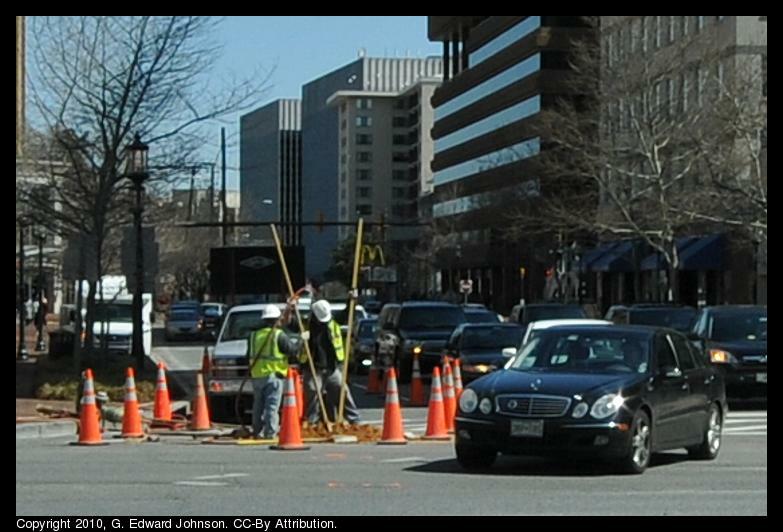 For most of the day people were out digging holes in the road at Wisconsin Avenue and East-West Highway in Bethesda, MD. They had a lane of traffic blocked of on each of those roads during the middle of the day. It looks to me like they still have work to do so I expect they will be back today. The question is "What are they doing?" I think I know. There are lots of orange lines painted on the road and alongside the road and many of them have a little flag that says "AboveNet, Caution, Fiber Optic Cable Buried Below" I think they are putting in some new fiber. 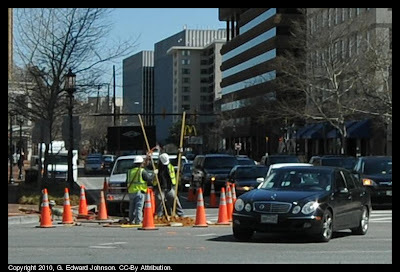 I also saw the flags on Montgomery Lane near Arlington Road so they may be in the area for a few days with this project. D. Gilpin jewelers on the corner of St. Elmo Avenue and Woodmont Avenue is closing at the end of the month. The owners, Denny and Dalia Gilpin are retiring after almost 30 years in the business. Until March 31st, everything is 50% off so if you are in Bethesda, MD in the next week or so, drop by and take a look. 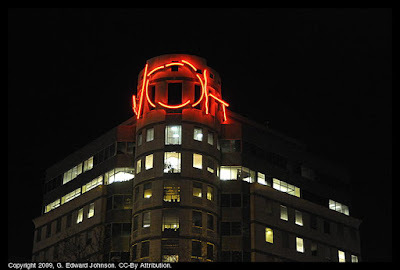 I occasionally here people ask about what that huge neon sign on the building at the corner of Wisconsin Avenue and East-West highway in Bethesda, MD is. Well, the building is the Crescent Building and the neon sculpture is a crab! No really it is, I'm serious. It is a little bit abstract but you can kinda see the circle being the body and the squiggly lines being the legs. It isn't something I would put on any of my office buildings (if I had any) but at least it is distinctive. The snowpacalypse was on February 6 then we had another big snow then exactly one month ago on the 10th we had another one. It seems like it has been longer than a month, but I am still cleaning up from it. The warm temperatures over the past few days have really made the snow melt. 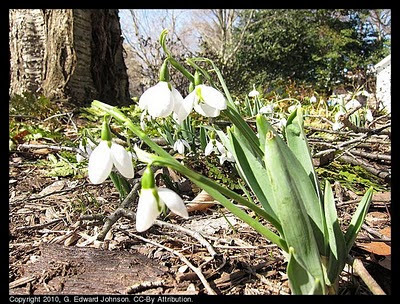 There are still lots of little piles scattered around, mostly in areas that are always in shadows. 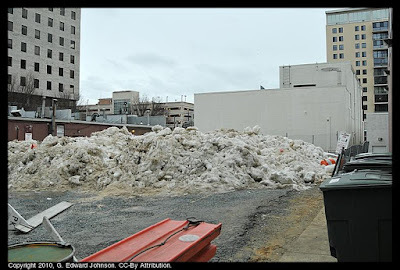 A week and a half ago I posted a story about large piles of snow in a parking lot that I saw here in Bethesda, MD. Well, I thought I would check back in on them and see how they are doing. This snow has been melting constantly for weeks now. The low temperatures have been above freezing the past few nights and the highs have been in the 50's or 60's. 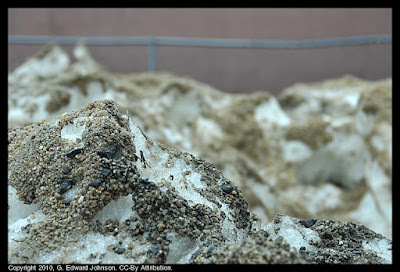 Even with all that, there are still some good sized piles of snow left. It is melting quickly though, I came by on Monday and that orange and white construction barrel on the left was still lying on snow then. 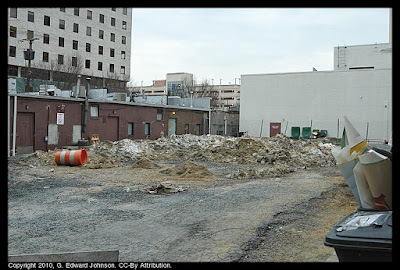 This lot is on St Elmo Avenue if you want to go by and see for yourself. For comparison, here is how it looked on February 26th, just a week and a half ago. If you look closely you can see the top of the construction barrel on the left. Anyone want to make a bet on when the last of the snow is gone? Update 3/24: I went by there this morning and it is really, truly, totally gone. The only reminder it was there are small piles of light colored sand. About 200,000 people in the DC Metro area got a crash course in staying warm when the power goes out in the middle of the winter. 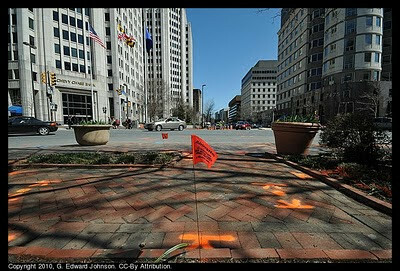 Montgomery County MD was particularly hard hit, residents were without power for several days. I was without power for 35 hours and thought I would share with you some of the lessons learned. I've lived in this area my whole life and this is the first time I have had an extended winter power outage. Every major snow or ice storm brings at least scattered outages but your chances of being affected aren't that high. Older areas with above bound power lines and mature trees are most at risk. Cooking: If you have a gas stove stove you can probably still cook. Don't count on the oven working and you may need matches to start the burners (If you have a pilot light you don't, if when you turn the burner on you hear a 'click, click, click' then you have an electric start and will need matches). You can also buy a camping stove to have for emergencies or use your gas grill. Hot water: and water in general. Around here almost everyone is on county water and it works fine when the power is out. If you had a well you would have to worry about that. If you have a natural gas hot water heater it will probably work, check to see if there are any electric wires going to it, no electric, it works when the power is out. Medical needs: Do you have any special medical needs that require electricity? Do you have any medical conditions that will be made worse by prolonged exposure to cold? Pipes freezing: After a couple of days without heat you have to start worrying about your pipes freezing. You can reduce the risk by leaving the faucets open a tiny bit. It costs water, but that is cheaper than replacing pipes. Comfort: Hey, some people like being warm and watching DVDs, maybe you are one of them. Winter power outages are a bit different from summer ones. Because of snow and ice, it can take them longer to get to and fix power problems than it does in the summer. It is also more likely that you will not be able to get out of your neighborhood and get to someplace that does have power. There were several of my neighbors who had places they could go but couldn't get their cars out to the main road. Dress warm: As everyone says, dress in layers, it really helps. Here are some specific dress warm ideas: Slippers and wool socks will keep your toes warm. A hat keeps your head warm, if the only hat you have is the hood of your jacket, go out and grab a cheap knit hat. Thermal underwear are cheap and really warms you up, especially your legs. 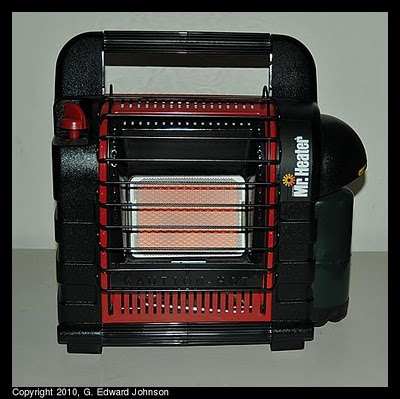 Portable heater: A few years ago I got a portable propane heater. For the most part it has languished in my basement but it came in handy for this. You want one that is indoor safe and those cost a bit more. Indoor safe ones turn off if the flame goes out, if it tips over, or if oxygen levels get to low. You can get ones that operate off of disposable one pound propane cylinders. I have the Mr Heater "Portable Buddy" heater (see picture below) New versions look slightly different but operate the same. It is a bit hotter than the portable electric heaters and on high will warm up a bedroom (slowly). A propane cylinder lasts about 3 hours so be sure you have enough spares. You can also get adapters to refill them from a 20lb propane tank like a gas grill uses (not sure about the safety implications of that). If I were to do it over, I would buy the Mr Heater "Big Buddy" which puts out twice the heat (and uses propane twice as fast), and, importantly, has a battery operated fan to distribute the heat better. Gas fireplace insert: I don't have one of these but many of my neighbors do. One neighbor has gas fireplace logs and they didn't help much at all, but several with inserts say it did keep one room warm. I am going to look into getting one. Kerosene heater: Kerosene heaters are great if you use them regularly, people use them to keep one or two rooms warm then lower the heat in the rest of the house. However, they do take maintenance and you have to keep the fuel fresh. I wouldn't get one of these just for emergency use. Generator: Wonderful things, they let you keep the refrigerator, tv, and lights on. If you have a natural gas furnace they can power the blower and you can have sweet heat. I have one of these and will go into more detail below. Above: the Mr Heater "Portable Buddy" indoor-safe propane heater runs off of disposable one pound propane cylinders. Generators require maintance. Twice a year I run mine for a while to make sure it keeps working. I also put fuel stabilizer in the gas I keep for it. Every year I replace the stored gas (putting the old gas in my car). If you don't do this then it may not start when you need it. One of my neighbors had a friend bring a generator over and they couldn't get it going. Generators are noisy. Honda make some small (1500 watt) ones that are very quiet and very expensive (around $2,000) cheaper ones are noisier and the bigger they are the noisier they are. The least expensive ones for a given wattage are the noisiest. Mine is about as loud as a lawnmower, I don't run it overnight because the only thing worse than being without power is being without power and having someone elses generator keep you awake. Size appropriately. They start around 1500 watts. These are enough to run a single circuit, like the furnace or the fridge but not both (you should be able to run some lights too). 3,000 watt generators can run two ciruits which is great but that means they are bigger, louder and use more fuel. For most people, a small generator will be sufficient. I have a 3,500 watt one but could easily work with a smaller one. Get the right extension cords (and enough of them). The more power you draw, the thicker the cord needs to be. The longer the cord the thicker it needs to be too. Lightweight cords are fine for running the weedwacker but I would hesitate to use one to run the fridge all day. I use 12 gauge cords, they also make 10 gauge ones if you want to be safe. 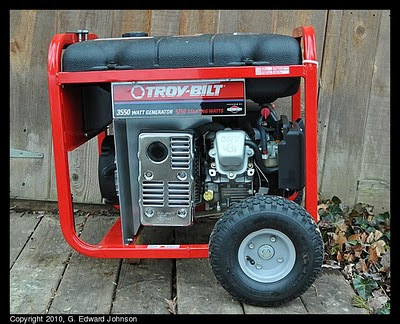 Keep in mind where you will be running the generator and make sure the cord is long enough, when there is two feet of snow you won't want to drag the generator so it is close enough to the house. If you have multiple circuits, make sure you have multiple extension cords. I only had one heavy duty one so couldn't even use the second circuit until I borrowed a cord from a neighbor. Don't run the generator inside. I feel like I am insulting your intelligence by even mentioning this, but people sometimes do. That means don't run them in the garage or by an open window too. Hopefully this helps you plan for next winter. These observations hold for Maryland and surrounding areas, as you go further north it gets colder and probably has different requirements (being without power when it is zero degrees is different that being without power when it is 30 degrees). As you go south it becomes less of an issue.